In June 1919 Denton Urban District Council decided to collect the names, addresses, and service details, of all those from the area who had served their country during the Great War. In the weeks that followed enumerators were sent from house to house collecting the names of those who had served. Residents of Denton were also encouraged to write to the council with the details of relatives who had served. The Denton War Memorial, unveiled on July 23rd 1921 in Victoria Park, Denton, was compiled from the resulting listing. Fortunately the original notebooks in which the enumerators recorded the names, along with many of the letters received by the Council, have survived. These are now part of the records of Denton UDC, held by the Tameside Archive Service. These have now been transcribed and entered onto a searchable database, which can be accessed by all those endeavouring to find details of Denton`s First World War servicemen. 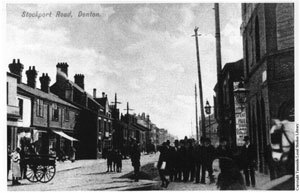 It is estimated that in 1914 the population of Denton was approximately 17,000, of which just over 8,000 were males. 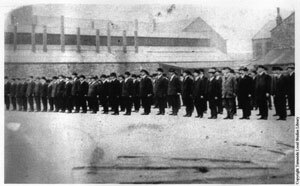 It is also estimated that almost 3,500 Denton men served during the Great War and that of those, 379 lost their lives. This listing comprising approximately 2,500 men is not complete, nor, as with any such listing, is it 100% accurate. Therefore we would ask anyone who knows of Denton men not included here, or who finds inaccurate information about a serviceman, or indeed who can supply us with any further information regarding any of the listed men, to contact us via the link provided below. We will endeavour to add all relevant information as soon as possible. Finally we would like to acknowledge the support of the North West Museums Libraries and Archives Council (NWMLAC), without whose generous funding support this project would not have been possible.